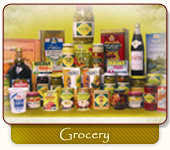 We carry products from all around the Middle East and surrounding areas. You can find dates from Tunisia, cookies from Spain, cheese from Bulgaria, olive oil from Italy, homous from Lebanon, zam zam (Mecca water) from Saudi Arabia, olives from Turkey, tea from Sri Lanka, rice from Pakistan, spices from India, the list goes on. We would love it for you to come in and see what Middle Eastern food is like. A Division of Khalil & Sons, Inc.